Welp, November will be an adventure from 195 to 190. I suppose I was only kidding myself that I could skip the game, eat more junk, and still lose the weight. But to be honest, Sparkpeople fed my delusion. I bike to work. Have for years. I wore a HTC monitor and average maybe 130 bpm for the trip, that is an estimated 200 calories burned for my age, height, weight and gender. Sparkpeople agrees, so I am basically 400 calories in the hole on workdays and I happily fill that hole with junkfood while remaining within my range. Except I can stay within my range, make my cardiovascular quotas, and gain weight. I am not a researcher or a nutritionist, but I know my body. She needs quality foods regardless of calorie total and she is accustomed to the bine riding so my commute doesn't really count as exercise anymore (for weight loss purposes anyway, it is still great for my health) So BOOOOOOOOO. I wanted to be out of 195 which fits like a cheap suit. It is not me, is not my usual range at all. I am "usually" ~185 and my super-fit self is 165. But I have to work for it. I stayed sober at the Halloween party and all weekend but I did have candy and Yes, I have an ache in my neck where the migraine begins. I did my rituals to keep it at bay and now I will try the gym. Goodbye, 195. You have seen your last month. Definitely agree with the bike ride not counting, it's a part of your routine now! I feel like that's how the gym is for me. I really have to go above and beyond to make something count. So unfortunate of being so active! Love the pic! 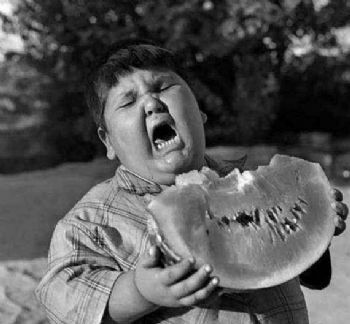 That's what I look like when I eat watermelon too! It's gross! I agree on the bike ride to work not being exercise anymore. I never counted standing on my feet for 9 hours at a time exercise either. Your body adapts. Very Eye-Catching Photo! Very Interesting Story...Thanks For Sharing! Stay focused on your goals and you will make 185!